How can we make storage in liquid nitrogen a routine activity? Some seeds, for example those of many tropical crops, cannot be dried for storage. In addition, some crop plants, such as banana and garlic, do not usually produce seeds and are propagated vegetatively. And some species do not breed true from seed anyway and so are conserved as clones. In these cases, the whole plant must be conserved. Some collections are kept in field genebanks, as full-grown plants, and others as tissue culture, as micro-plants growing in vitro (in test tubes). Traditionally, these crops are maintained as plants in the fields in potentially vulnerable conditions exposed to pests, deceases and environmental fluctuations. To mitigate those risks, some crops can be conserved in in vitro genebanks, using artificial growth media, under a controlled environment and sterile conditions. Being an important component of clonal crop repositories, in vitro cultures serve as a secure backup of field collections and provide phytosanitary-clean material for research and germplasm exchange. Yet in vitro conservation requires a routine, but laborious process of regular material transfer to a fresh growth media. Another challenge is that the long-term maintenance of plants in vitro increases the risk of somaclonal variation: spontaneous mutations caused by non-optimal, not natural conditions and application of several chemicals that are necessary for plant growth. Cryopreservation offers a cost-effective way to reduces those risks and store these accessions for the long term. Cryopreservation is the process of preserving living systems by freezing them and storing them at ultra-low temperatures provided by liquid nitrogen (-196°C) or its vapor phase (-150-190°C). The method has a wide application for the long-term and secure storage of animal and human cells and microbial collections. Cryopreservation is increasingly used to conserve crops that do not produce seeds (such as banana), do not breed true from seeds (potato, onion, most fruit trees) or have seeds that are desiccation- or chilling-sensitive and therefore cannot be safely conserved in a dried state in genebank cold rooms. Cryopreservation conserves plant genetic material at a decreased temperature to suppress molecular motion and arrest metabolic and biochemical reactions thus achieving a “suspended animation” state in the samples. There are very few biologically significant reactions or changes that occur in the conserved material. Once cryopreserved, samples can stay alive for hundreds of years, yet will fully retain their genomic and biochemical properties upon retrieval from a cryotank. At present, cryopreservation is the only method that offers this high level of genetic stability over the long-term conservation period. Cryopreservation generally require a significantly smaller space than other conservation methods and has limited needs for monitoring. Cryobanks can therefore provide an important opportunity to allow the rationalization of field and tissue culture collections. Since the first experiments with seed cryopreserving seeds at the end of 18th century, cryopreservation of plant genetic resources has advanced significantly. But there is a huge scope for further development and mainstreaming of cryopreservation protocols to include more genotypes and species. Being an advanced method of conservation, cryopreservation requires extensive knowledge of plant stress physiology, well-developed infrastructure and skillful personnel. 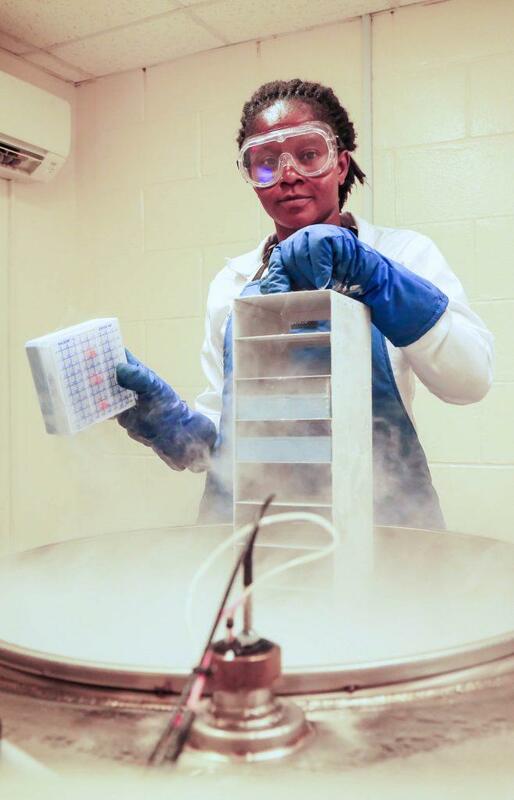 This level of infrastructure and expertise exists in CGIAR genebanks, where cryopreservation is routinely implemented.